The Beekman Paper & Card Co. was originally located at 56 Beekman St. in New York City. They were wholesale paper dealers, stocking all types of paper products for retailers. Founded in 1907 as the family business of Max Greenbaum (1881 - ?) and Alma Greenbaum (1888/89 - ? ), they opened a second location at 318 W. 39th St. in 1918, then relocated to 137 Varick St. in 1926. 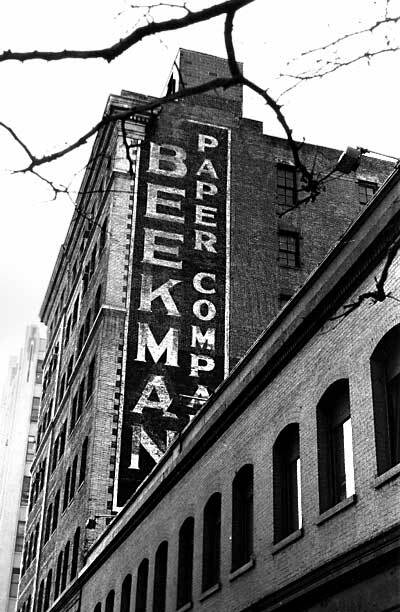 The name changed to Beekman Paper Company in 1951, and they were in business here until the late 1990's. For Beekman's neighbors at 318 W. 39th St. see Walter's other site: 14to42.net.